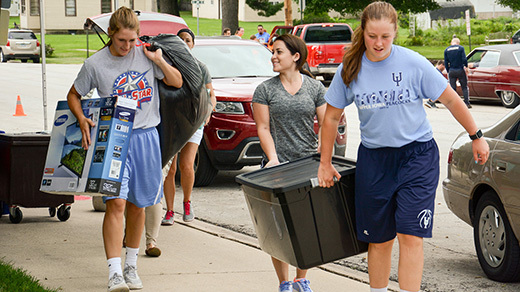 Upper Iowa University volunteers welcomed new students to the Fayette Campus and helped them move into their residence halls on Friday, Aug. 19. A whirlwind of activity stretched across Upper Iowa University’s (UIU) Fayette Campus this past weekend as students returned for the start of the 2016-2017 school year. On Friday, Aug. 19, a mass of volunteers welcomed new students to Fayette and helped them move into their residence halls. Three days of events, orientation, and entertainment followed, dubbed the Peacock Experience. Additional photos of the Peacock Experience weekend activities can be viewed at facebook.com/upperiowauniversity or flickr.com/photos/upperiowauniversity.